So much more than just a fork... Introducing our 100% Post-Consumer Recycled Content Cutlery, the first of its kind made from 100% post-consumer recycled polystyrene. Traditional single-use cutlery is made from unsustainable virgin plastic. 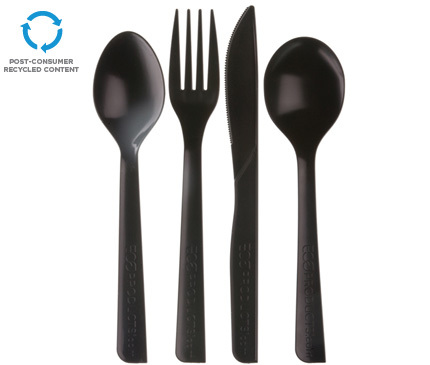 This recycled content cutlery is an industry-first, environmental solution that can help keep waste out of landfills. 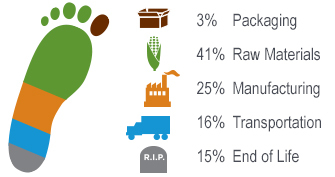 Cut excessive waste out by choosing 100% recycled content. This recycled cutlery is an industry-first, environmental solution that can help keep waste out of landfills. Most disposable cutlery is made from unsustainable virgin plastic. A bundle of recycled goodies for your next snack! Folded Napkin: 2.25 in. x 6.25 in. Unfolded: 13 in. x 12.25 in. Why go back to traditional plastic when you could have this heat tolerant, 100% recycled content spoon?